Orthodox Church liturgical Clergy stikharions (albs) (black-silver) by Istok Church Supplies Corp.
Why settle for poorly made clergy stikharions when you can purchase affordable, high-quality, custom-tailored clergy stikharions from Istok Church Supplies? We offer these important liturgical garments in a wide range of color combinations including black-silver. Take a look at our black-silver clergy stikharions and order from the comfort of your home or workplace! Our black-silver clergy stikharions are perfect for use during the sacred Lenten period. 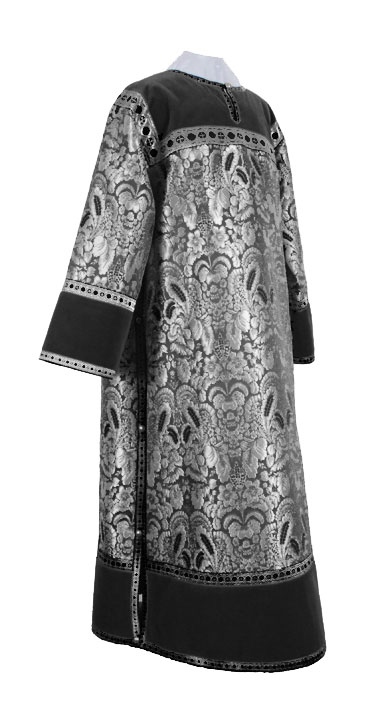 In keeping with Orthodox Christian vestment traditions, they are open-sided for tonsured persons and are made from beautiful liturgical fabrics such as rayon brocade, metallic brocade and natural German velvet. We have tried to provide a diverse range of interesting fabric patterns to appeal to all tastes. Customers can purchase a stikharion as it is or opt for a different fabric belonging to the same class as the one on display. Coming to decoration, we provide crosses and galloons for all our black-silver stikharions to enhance their beauty. Customers can choose from three decoration types – economy, premier and luxury. For economy style (default and free-of-cost style), we provide inexpensive galloon and plain crosses. For premium style, we provide machine embroidered crosses and quality galloon. For high-end luxury style, we provide solid jacquard galloon and hand-embroidered crosses. Customers can also add natural velvet inserts to their orders. For added comfort and durability, we have provide full natural rayon lining for all our clergy stikharions. To create the right impact, a clergy stikharion should fit perfectly. For this reason, we offer made-to-measure services. You can have an impeccably tailored clergy stikharion simply by providing us your precise measurements online. Our experienced ecclesiastical tailors understand nuances of Orthodox Christian vestment traditions and pay close attention to detail while implementing individual work orders. Whether it is browsing experience, ordering process or international shipping, we take your needs seriously and strive to provide highest industry service standards. Shop from our top-of-the-line collection of black-silver clergy stikharions and make liturgical worship more meaningful!